It’s no secret that the 2015 Mustang is the hottest thing in the performance aftermarket right now. While we were walking the aisles at the PRI show, we couldn’t help but spend a few minutes staring at the Watson Racing 2015 Mustang. We featured this car, which made its debut at the SEMA show, over a month ago. While the car is incredibly cool, what was really drawing our eye at the booth were two new 2015 Mustang Racing Hoods on display. The first is the three-inch cowl hood that the Watson 2015 Mustang wears. 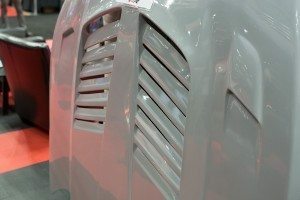 The second is the Tiger Racing hood, which is designed with road race applications in mind, and features a heat extractor design. 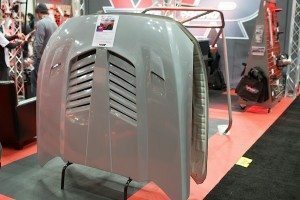 “The Watson Racing hood is a three-inch cowl, available in fiberglass or carbon fiber, and uses the factory styling lines to give it an OE level of fit and finish. Both the Watson Racing and the Tiger Racing 2015 Mustang Racing Hoods use the factory mounting points and latches for an easy bolt-on fit,” says Watson Engineering’s John Phillips. 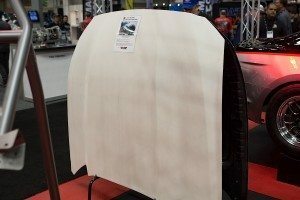 While a car wasn’t on display at the booth wearing the Tiger 2015 Mustang Racing Hood, we can just see this thing bolted to a road race build, or even to a really cool handling oriented street car. We’re wondering if it wouldn’t make a great addition on a top speed car, like those running the Texas Mile, as a way to vent turbulent undressed air, while keeping things cool under the hood. Phillips says that both these hoods should be available from Watson Racing just before the end of the year.